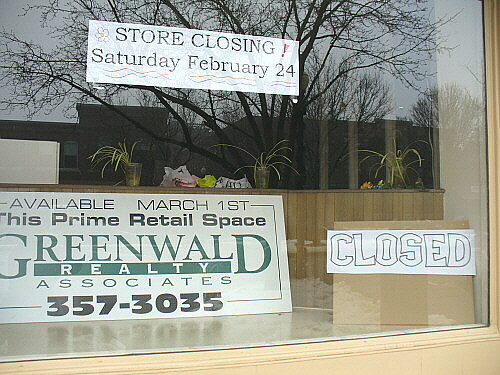 While I’ve been preoccupied with the off-blog obligations of teaching and grading, there’s been a mini-exodus of stores from downtown Keene, winter being the slow season for retail business. Remember the boutique whose window I showed you smashed and then repaired? 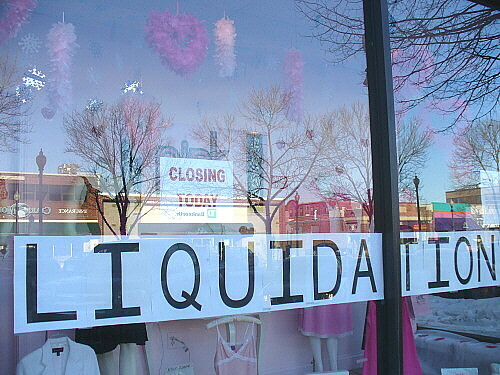 They’re now closed, having liquidated much of their inventory in order to move their brick-and-mortar business online, leaving an empty shell in the place of their once-colorful window display. After some 40 years of business, Paulsen’s Bookland has similarly pulled up stakes, closing stores both here in Keene and in Concord, NH. It’s difficult to maintain a small, family-run bookstore with heavy competition from online and Big Box retailers; truth be told, I never bought anything at Bookland, disappointed that it stocked more magazines than books. 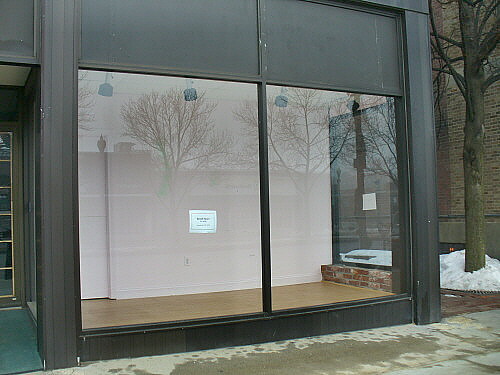 Although I as much as anyone agree with the downtown merchants’ slogan that “It’s Keene to Shop Locally,” I don’t buy many magazines, and I don’t frequent upscale boutiques: my business isn’t the kind either of these stores tried (unsuccessfully, apparently) to court. Still, the sight of empty shop windows is a sad one, something that makes me wish I were a more Conspicuous Consumer whose wallet could keep Ma and Pa in business. Instead, I tend toward frugality, tending to the off-blog obligations of teaching and grading, walking the dog, and taking pictures: activities that do little, unfortunately, to fuel the local economy. I’ve given up photographing objects: these days, all I want to capture is the angular intersection of line and light. I suppose some photographers venture out of their houses specifically looking for images; me, I let lines and light come to me. 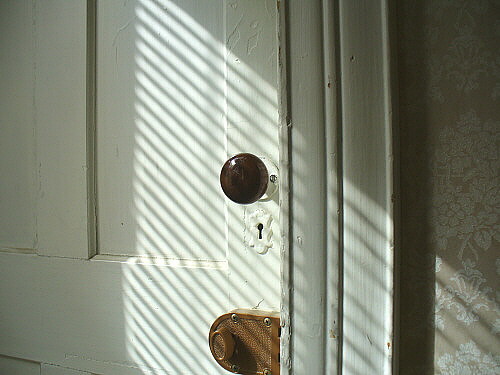 Like a cat curling into the warm spot created by an angled sunbeam, yesterday my attention was drawn to the glowing spots where light slanted through window blinds, the slats creating a geometrically interesting slant. Seeing the world sliced is novel enough; seeing the world not as object but as shape is even more novel, the mind skimming the surface outline of things rather than sinking to the level of name. This is no longer “house,” and that is no longer “tree”: now they each are an interesting, intertwined constellation of line and angle, a geometry problem arranged in two dimensions like a sketch. Haven’t you ever longed to leave the world of reality and enter the purely theoretical? The world of shape and line is super-real, a realm apart where even ugly objects allure with sensuous shapes and forms. As a writer, I’ve always been transfixed by lines; as a photographer, I’ve come to fall in love with light. Have you considered the miracle that brings a nascent god into our midst every day? At Keene State, there is a stone monument honoring the scientists who study gravity, a force we seldom remember as being essential to our mundane lives…but where do we remember the miraculous power of light, the very fabric of our existence as seen and seeing creatures? 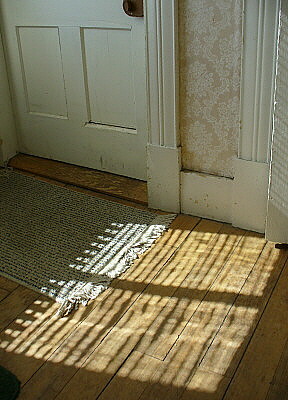 Take nearly any object, shine some light on its matter, and you will behold an interesting and intriguing thing: even the dusty, well-worn floor in an aging house, its boards sliced thin by slatted sun, glows with unadorned wonder. What is this? How many times have I seen and passed by, unaware? Carrying a digicam with me these past three years, I’ve become a connoisseur of light and line, relishing the varied ways each falls and lies. What is the world but a tangled, tender matrix of light and line, each splayed into varied vectors? If we were to strip objects to their constituent parts, we’d be left with the angles of light and line, a child’s drawing of sticks and circles. The sun is a circle surrounded by beaming sticks; we ourselves are sticks intersected and folded. The lines and light in our lives typically go unheeded; we notice them as little as fish notice water. Instead, like children we are tempted by baubles, grasping and clinging to the objects of daily life with their discreet names and forms: window, wall, floor. 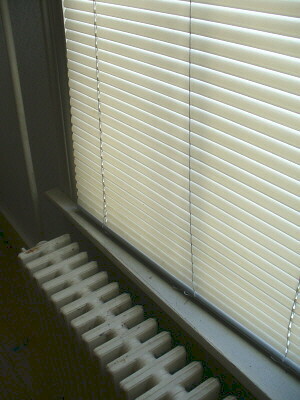 But that which lies behind these objects, the Thing that fills and sustains them, is nothing more than Light and Line. 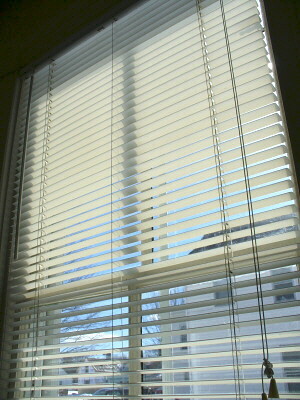 A blind man can feel the warmth of light on his face; a blind woman can trace the outline of a window sill with her hand. How blind are we sighted ones, then, who forget both surface and shape because of our insipid search for the Deep Meaning of things? If there were no meaning, we’d satisfy ourselves with the superficial surface of things, and presumably we’d be happy, wandering the world like the newly sighted, awed and aghast at the profusion of shapes that surround us. Instead, we look at the world and tell ourselves there must be More, refusing to embrace a sea of shape as All We’ve Got. On winter afternoons, though, a certain slat of light more than suffices, brimming and welling into the sunken surface of things, spilling into the space a poet reserves for joy. It’s a rare day that I set out looking for images; most mornings, merely walking the dog is the prime priority. Today was typical in that I wasn’t consciously looking to take pictures while I walked Reggie around the square…and today was typical in that I barely got downtown before I’d fished my digicam from my bag, fixated on some silly something that had never caught my interest before. Mind you, I’ve been walking the dog this same route almost everyday for some three years now: you’d think I’d have seen–and shot–everything. But no. 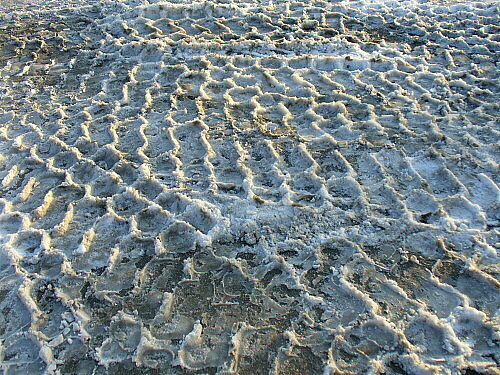 This morning I was struck by the painstaking pattern–so like chain mail!–of a snow-plow’s tire tracks in street-dirtied snow. Have I seen this sight before during three years of dog-walking? Probably. Have I ever shot it before? Presumably not. And so here you have it: one shot that says “This Morning,” a silly something that struck me today in a way it hadn’t ever done before. I’ve always wondered about the odd pose the bronze Henry David Thoreau statue strikes outside the replica cabin at Walden Pond. Is Henry eternally frozen while staring at his fingers, or is there something in his seemingly empty palm that he is contemplating? When I was an admittedly odd child, I used to spend countless hours in bed at night contemplating my own hands, marvelling at the way they moved and gesticulated, their movements (even the most subtle) being something I could control without even thinking about it. What sort of divine designer, I wondered, invented something as simple and mundane as the human hand? Did God craft the Universe with similar-looking–albeit divine and supernaturally abled–hands, or is God’s handiwork of an entirely different kind than ours? Having stared more than a bit at my own hands and fingers, I’ve always smiled at Thoreau’s bronze statue: was Hank a kindred spirit? After sauntering through the slippery, sand-like snow at Walden Pond yesterday, I had to smile–and snap a picture–when I saw the work of unknown, presumably human hands who’d rolled a snowball for Henry’s brazen consideration. In Shakespeare’s Hamlet, Hamlet encounters the barren skull of a deceased old friend and laments his passing while contemplating his skull: “Alas, poor Yorick!” Is Thoreau thinking something similar as he contemplates what looks like snowy skull, marveling at the impermanence that brings snow in February, melt in March, and green leaves in April and May? I’ve lived in New England for about fifteen years now, and during that time I’ve circled Walden Pond countless times, in various weathers, both alone and with companions. 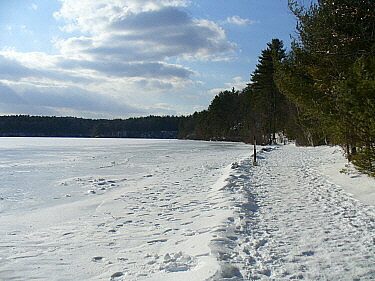 Yesterday Leslee, some mutual friends, and I stomped and slipped through the squishy, sometimes ice-crusted snow that circles the pond, occasionally stepping aside to let hikers with snow-shoes, boots, and YakTrax pass us in the opposite direction. The ice at Walden Pond looks solid these days, and yesterday we saw several hardy souls traversing it on skis: a chilly, wind-blown endeavor. 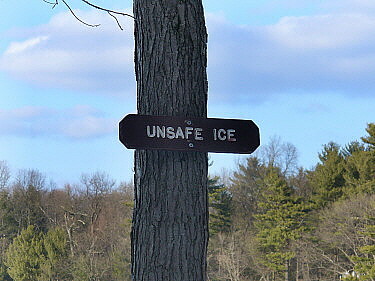 And yet, signs urged us to distrust the pond’s seemingly solid, snow-clad surface, as did several thinning spots where dark water seemed ready to breach the skimming surface of pristine white snow. 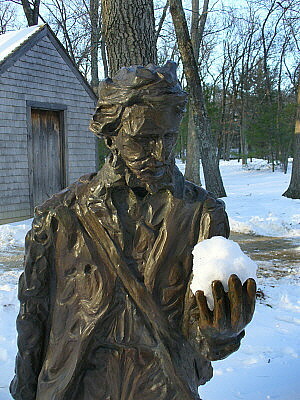 Alas, poor Henry, the lesson of snow, skulls, and dead writers is that impermanence surrounds us: although a brazen figure stands in all weathers outside a replica of Thoreau’s humble house, the snow in his hands is destined to pass, melting in the hot hands of spring’s eventual thaw. Who cares what waif-thin supermodels are wearing as they strut the catwalks of Paris and Milan…the real question is what average-sized New Hampshire bloggers wear on dogwalks during a February snowstorm. As I’ve blogged before, Reggie insists on his daily walk regardless of the weather, so on Wednesday when the snow fell all day and the wind grew increasingly impertinent as afternoon deepened in to night, I opted for the “layered eclectic” look, donning boots and knee-high gaiters; puffy down coat topped with a Gore-tex shell; and scarf, hat, and hood to keep me (relatively) warm and dry. It’s not an elegant look…but it gets the job done. And given the relative lack of walkers cruising the snowy streets of Keene on Wednesday afternoon, when Keene State cancelled classes and roughly half of the businesses downtown closed early because of the weather, it’s not like many people saw much less cared what I wore to walk the dog. Although it’s difficult (and dangerous to one’s digicam) to snap many photos during near-blizzard conditions, the aftermath of any winter storm promises to be picturesque…at least once you’ve dug out from said aftermath. I eventually shoveled out my car, driveway, and a walkway to and from my front door…and my upstairs neighbor took a saner path, hiring a snowplow to clear our driveway parking spots after I’d finished clearing mine. They say that she who hesitates is lost, but in the case of driveway-shoveling, she who hesitates is freed from frost by the skillful manuevering of an attentive plow-guy. 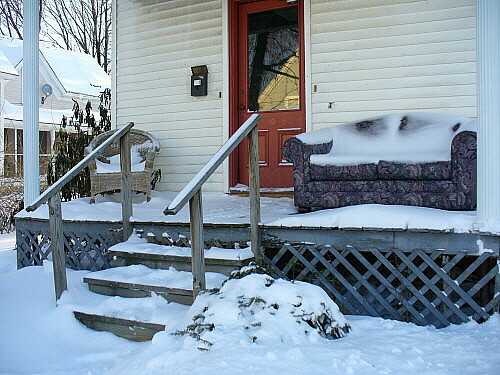 If nothing else, February snowstorms provide yet another reason why you shouldn’t let feral furniture spend the winter outside, even under the shelter of a front-porch roof. Can you say “snow-fa”? This is my day-late contribution to this week’s Photo Friday theme, Self-Portrait 2007. You’d be surprised by the things an early British lit prof leaves lying on his desk when he’s out of the office. 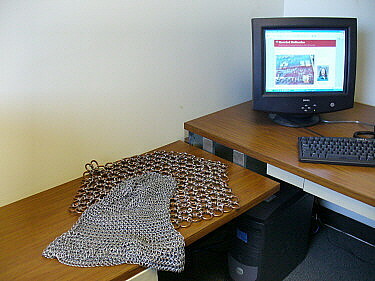 At Keene State, I share a basement office with another adjunct English instructor who is teaching a course on “Warriors, Knights and Lovers,” and last week he and his students were apparently talking about medieval weaponry and armor. 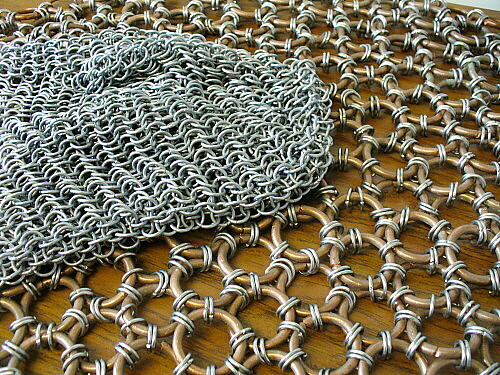 It’s not uncommon for me to arrive at my office to find email awaiting me, but felt unusual to arrive to a neatly arranged pile of chain mail. I am a link in Lord Buddha’s golden chain of love that streches around the world. I must keep my link bright and strong. I will try to be kind and gentle to every living thing, and protect all who are weaker than myself. I will try to think pure and beautiful thoughts, to say pure and beautiful words, and to do pure and beautiful deeds, knowing that on what I do now depends my happiness and misery.May every link in Lord Buddhas golden chain of love become bright and strong and may we all attain perfect peace. When I first started meditating, before I’d found spiritual refuge in my current Zen school, I practiced at a Buddhist temple where we’d occasionally recite this prayer, or at least the first few lines. As a practicing Christian at the time, I wasn’t terribly keen about the “Lord Buddha” stuff…and as a rationalist, I smirked at the prayer’s devotional imagery. If I’d shunned the tackier, more touchy-feely elements of my native Christianity, why would I turn around and recite a prayer that felt like the Buddhist equivalent of “Kumbaya“? Today on Valentine’s Day, it seems appropriate for me to give my Smirking Rationalist a long-overdue rest. Although I’m still a bit leery about the “Lord Buddha” stuff, I guess I don’t have a problem with everyone keeping their individual “links” in the “golden chain of love” bright and shiny. Just don’t ask me to sing around a campfire about it. 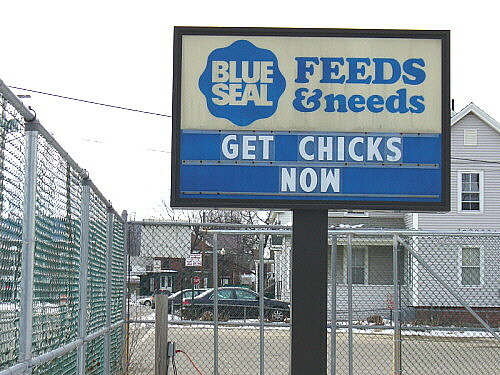 With Valentine’s Day looming, now might be the time to take an assertive approach to one’s love life…if, at least, you’re a dude looking for a chick. 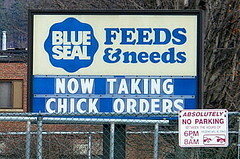 Do you think this local farm & feed store can guarantee chick-delivery by Wednesday?